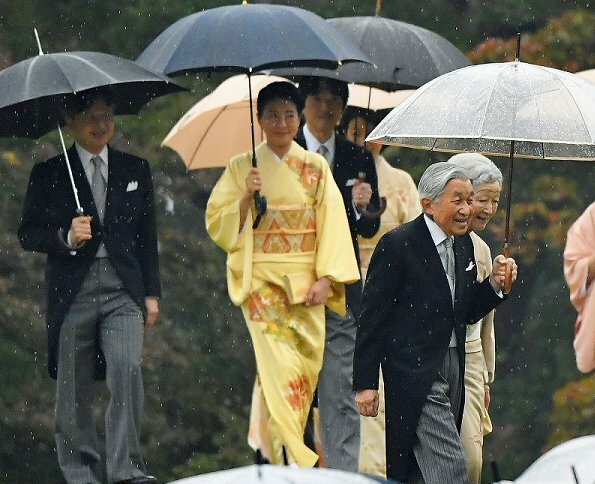 On November 9, 2018, Japanese Emperor Akihito, Empress Michiko, Crown Prince Naruhito, Crown Princess Masako, Prince and Princess Akishino, Princess Mako and other Imperial family members attended 2018 autumn garden party held at the Imperial Garden of Akasaka Palace in Tokyo. 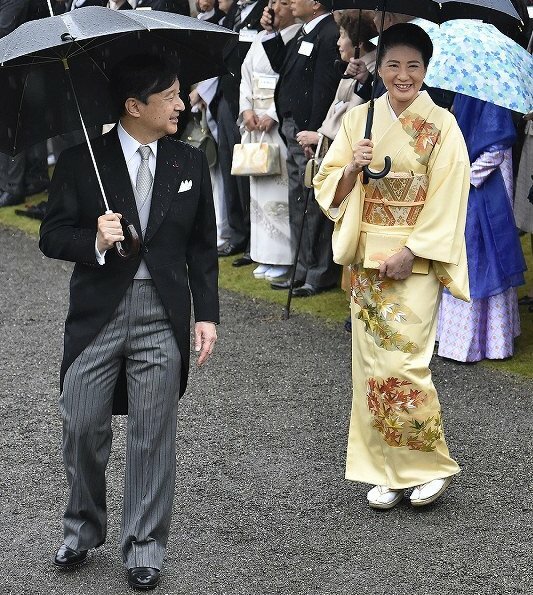 Crown Princess Masako attended an autumn garden party for the first time after a period of 15 years. 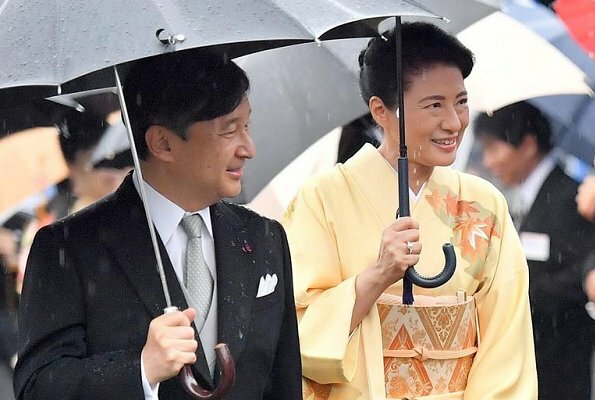 (Crown Princess Masako, who has long been battling a stress-induced illness, stayed until the end of the event for the first time in 15 years. In recent years, she had left the biannual party early). 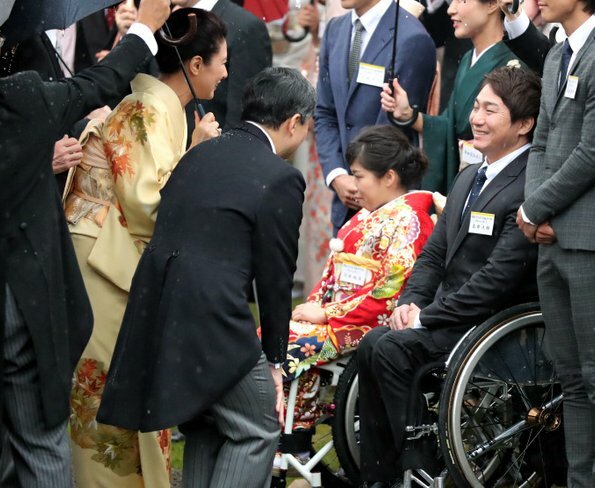 1800 guests were invited to 2018 autumn garden party. 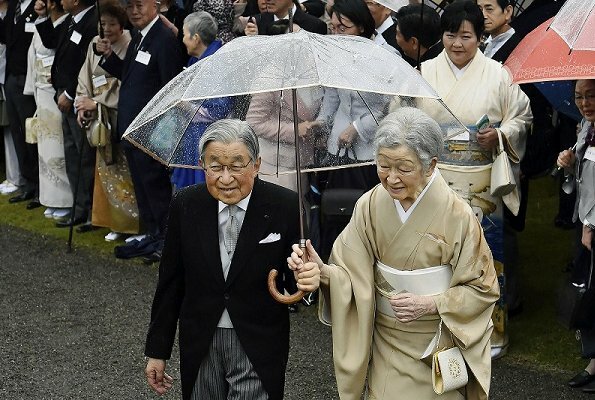 Wonderful Kimonos of all the Imperial Ladies. 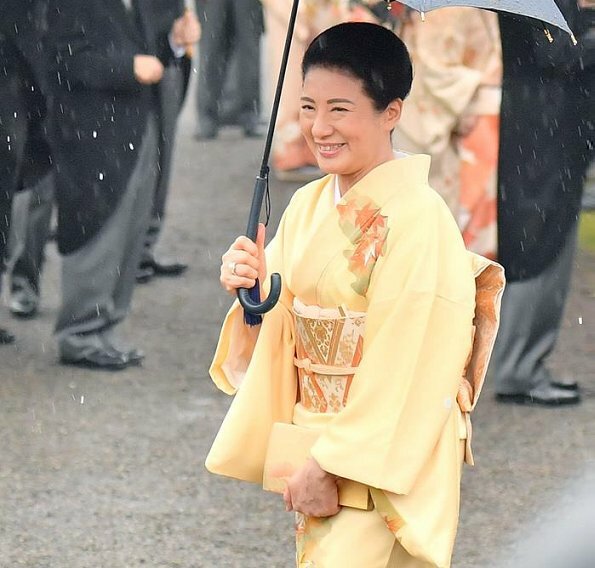 I must say I love the Kimono of the future Empress Masako the best and her smile is grand. CP Masako is looking wonderful. I'm very happy for her. I'm really looking forward to seeing her transition into her new role as Empress next year. That said, I'm also very fond of the current Emperor and Empress as well for as much as we know them from their public personae. Best wishes to them all. 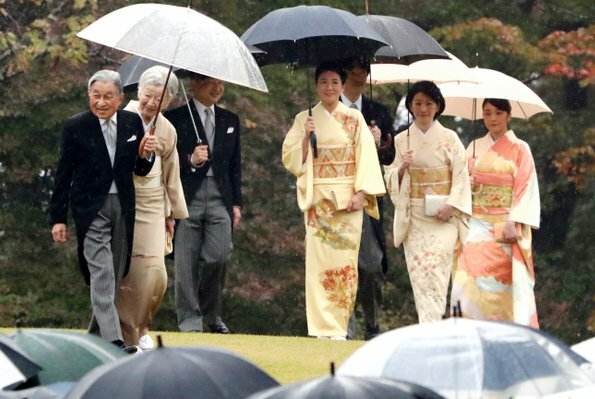 Wow what beautiful kimonos the royal ladies are wearing ? Love love the theme of all matching colors. 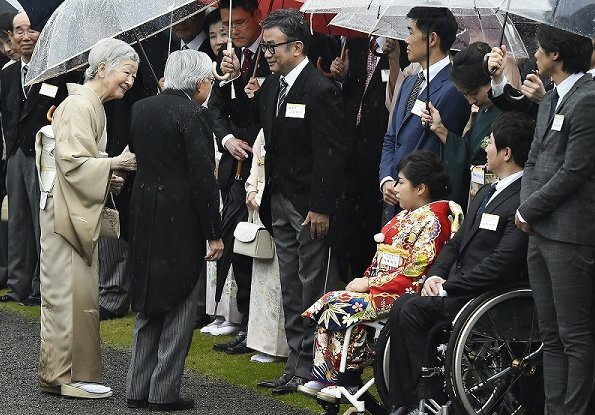 Princess Masako looks great, good to see her back. I agree, they have a very different concept of Western clothes. I am not sure why their interpretation is so off. 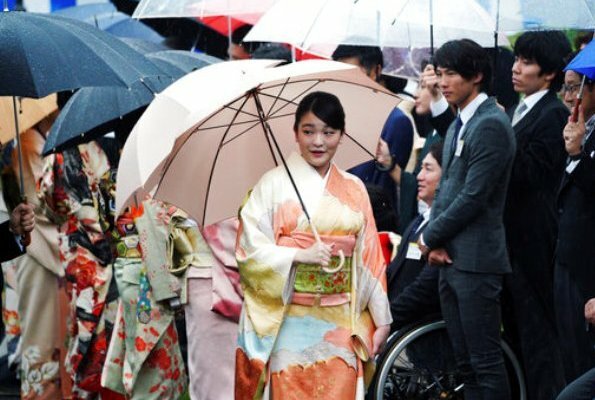 The ladies look so nice in their traditonal dresses, so sad, that the weather was so bad. C.P. Masako's kimono is amazing!!! Have you notice the embrodery of autumn leaves???. No doubt all the ladies are better with their kimonos tahn with western clothes. Happy to see Masako so confident and recovered. Does anyone know why only women wear traditional cloths? I can’t speak for the royals but I’m South Asian and I see this all the time, that the women wear traditional and men wear Western. Part of it is the women are proud of their national dress and appreciate the beauty of the clothes. Part of it is sexism where the women have the burden of carrying on tradition while the men feel like they’re taken more serious in Western suits and find their national dress “silly.” It often angers me when I see it in young children in a family during holidays and weddings. The girls are dressed in traditional and the boys are wearing pants and shirts. I would like to see men take pride in their cultural dress and wear it at the same occasions women do. The re-emergence of the CP Masako has been fab. She looks so so so regal. Masako looks so amazing! But am I wrong or does Mako look sad? I agree that these traditional clothes are absolutely beautiful and I belong to those who don't understand why only the ladies wear them and the men do not. All thee ladies look so good in kimonos. Cannot pick one winner. But sad they had such a rainy day for garden party. Can anybody tell me why they dont weare shoes? The kimonos are lovely! !